Frenaler Cort Tablets: Film-coated tablets: Box of 10. Frenaler Cort Syrup: Syrup: Bottle of 60 ml. Frenaler Cort Tablets: Each tablet contains: Desloratadine 5 mg, Betamethasone 0.6 mg. Excipients: pregelatinized starch; colloidal silicon dioxide; microcrystalline cellulose; crospovidone, siliconated talc; hydroxypropylmethylcellulose 3 cp; hydroxypropylmethylcellulose 6 cp, titanium dioxide, polyethylene glycol 400, polysorbate 80 ; Allura red aluminum lake. Frenaler Cort Syrup: Each 100 ml contains Desloratadine 100 mg; Betamethasone 0.5 mg. Excipients: sorbitol solution 70%; sodium benzoate; sodium citrate; citric acid anhydrous; disodium edetate; banana flavor; sugar; propylene glycol; purified water. 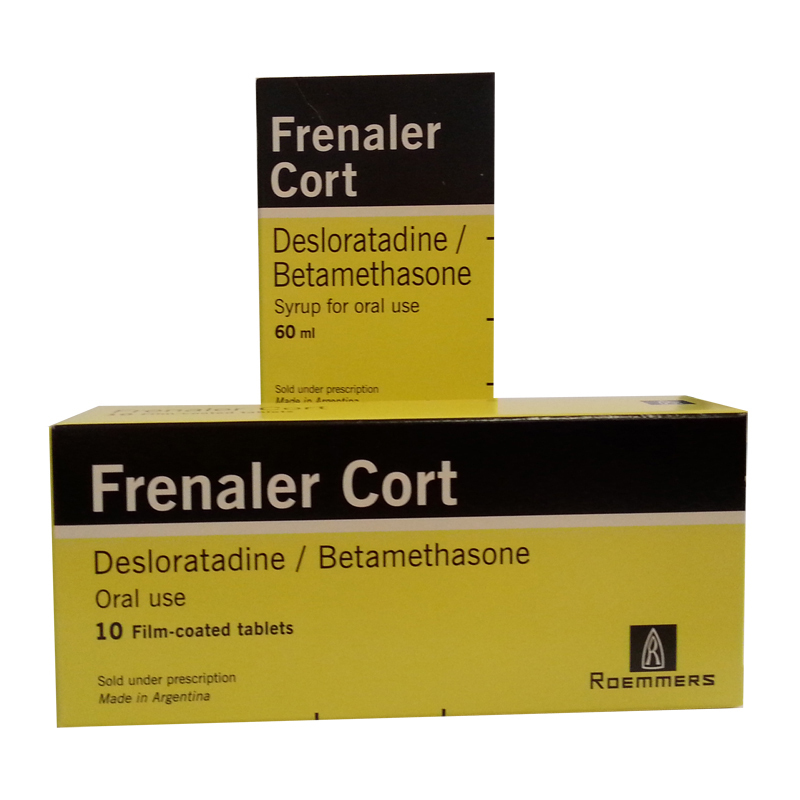 Pharmacological actions: Frenaler Cort combines the anti-inflammatory and antiallergic effect of Betamethasone and the non-sedative antihistamine action of Desloratadine. Desloratadine is a product long-acting tricyclic histamine antagonist, with selective peripheric H1-receptor histamine antagonist activity. It inhibits histamine release from human mast cells. Symptoms are effectively controlled during 24 hrs after one daily intake. Glucocorticoids, such as Betamethasone, cause profound and varied metabolic effects and they modify the body’s immune response to diverse stimuli. Betamethasone shows stromg glucocorticoid and weak mineralocorticoid effect. Desloratadine is well absorbed after its oral administration. It can be detected in plasma 30 minutes after administration and peak plasma levels are reached approximately 3 hrs post dose. There is no influence of food intake on absorption. Desloratadine and 3-hydroxydesloratadine are 85% and 87% (±2) bound to plasma proteins, respectively. Protein binding was unaltered in subjects with impaired renal function. Desloratadine is metabolized to 3-hydroxydesloratadine, an active metabolite, which is subsequently glucuronidated. There exists a subset of the general population which are poor metabolizers of Desloratadine, specially among black individuals. The mean elimination half-life of Desloratadine is 27 hrs. Elimination is in form of metabolites, equally distributed in urine and feces. Desloratadine does not easily cross the blood brain barrier. In elderly patients Desloratadine showed age-related differences in pharmacokinetics, but they do not justify dose adjustment in elderly subjects. Renally or hepatically impaired patients showed an increase in AUC. Therefore dosage adjustment is recommended for these patients. Betamethasone is well absorbed after oral administration. Betamethasone can already be detected in plasma 20 minutes after administration. Peak plasma concentrations are reached 2 hrs after oral administration and they gradually decrease during the following 24 hrs. No relationship was observed between plasma corticosteroid levels (total or unbound) and therapeutic effects; pharmacodynamic effects last longer than measurable plasma levels. Mean elimination half-life for Betamethasone is ≥ 300 minutes and mean biological half-life is of about 36 to 54 hrs. Naturally occurring glucocorticoids as well as glucocorticoids from synthetic origin, including Betamethasone, are metabolized in liver. Frenaler Cort is indicated for treatment of severe allergic conditions which require co administration of an antihistamine and a systemic corticosteroid: Atopic dermatitis, angioedema, urticaria, seasonal and perennial allergic rhinitis, allergic reactions due to food and medicines, allergic contact dermatitis and allergic processes involving the eye, such as allergic conjunctivitis. Frenaler is contraindicated in patients with known hypersensitivity to any of its ingredients, or to other corticosteroids. Systemic fungal infections, active tuberculosis. Dosage adjustment may be necessary based upon remission or exacerbation of the treated condition, depending on the patient’s individual response to treatment and the patient’s exposure to emotional or physical stress, such as severe infection, surgery or trauma. After discontinuation of a prolonged treatment or a treatment where large doses of corticosteroids were administered, patients may require an up to 1 year follow-up. Prolonged use of corticosteroids may produce posterior subcapsular cataracts (specially in children), glaucoma with possible damage to the optic nerves, and may enhance establishment of secondary ocular infections due to fungi or viruses. Average and large doses of corticosteroids can cause elevation of blood pressure, salt and water retention, and increased excretion of potassium. These effects are less likely to occur with the synthetic derivatives except when used in large doses. Dietary salt restrictions and potassium supplementation may be necessary. All corticosteroids increase calcium excretion. While on corticosteroids therapy, patients should not be vaccinated against smallpox. Other immunization procedures should also not be undertaken in patients who are on corticosteroids, specially on high doses, because of possible hazards of neurological complications and possible inhibition of antibody formation. Notwithstanding the above immunization procedure can be undertaken in patient on corticosteroids as replacement therapy, as for example in patients with Addison’s disease. Patients who are on immunosuppressant doses of corticosteroids should be warned to avoid exposure to chicken pox or measles. Patients should also be advised that if they are exposed, medical advice should be sought without delay. This is specially important in the case of children. Rapid discontinuation of corticosteroid treatment may lead to secondary adrenocortical insufficiency, which may be avoided by gradual reduction of dosage. This type of relative insufficiency may persist for several months after discontinuation of therapy. Therefore, in any situation of stress occurring during this period, corticosteroid therapy should be reinstituted. If the patient is already being treated with corticosteroids, an increase in their dosage may be necessary. Since mineralocorticoid secretion may be impaired, salt and/or a mineralocorticoid should be administered concurrently. There is an enhanced effect of corticosteroid on patients with hypothyroidism and in those with cirrhosis. Corticosteroids should be used cautiously in patients with ocular herpes simplex because of possible corneal lesions. Physic derangement may appear when corticosteroids are used. Existing emotional instability or psychotic tendencies may be aggravated by corticosteroids. Caution should be exerted when administering corticosteroids in following situations: nonspecific ulcerative colitis, if there is a probability of impending perforation, abscess or other pyogenic infection; diverticulitis; recent intestinal anastomoses; active or latent peptic ulcer; renal insufficiency; hypertension; osteoporosis; and myasthenia gravis. As complications due to corticosteroids depend on dosage and duration of treatment, each patient requires a benefit-risk evaluation concerning administration of this substance. Growth and development of infants and children on prolonged corticosteroid therapy should be carefully observed, as growth rates may be altered and endogeneous corticosteroid production inhibited. In some patients, corticosteroids may alter sperm motility and count. Pediatric use: Frenaler Cort should not be administered to children under 2 years of age. Corticosteroids may alter growth rate: Growth of children on prolonged corticosteroids treatment should be carefully observed. Desloratadine : No clinically relevant pharmacological interactions were observed when coadministered with erythromycin, ketoconazole, azithromycin, fluoxetine or cimetidine although increased plasma concentrations of Desloratadine and 3-hydroxydesloratadine were observed. There were also clinically relevant changes in the safety profile of Desloratadine, as assessed by electrocardiographic parameters (including the corrected QT interval: QTC), clinical laboratory tests, vital signs, and adverse events. Coadministration of Desloratadine and alcohol did not show potentiation of any alcohol-induced alteration. Betamethasone: coadministration with Phenobarbital, phenytoin, rifampicine or ephedrine may increase corticosteroid metabolism, thus reducing their therapeutic effect. Patients concomitantly treated with corticosteroids and estrogens should be cautiously observed in order to detect a possible increase in corticosteroids effect. Concomitant administration with potassium depleting derivatives may exacerbate hypokalemia. Concurrent administration with cardiac glycosides may increase the incidence of arrhythmias or digitalis toxicity due to hypokalemia. Corticosteroids may increase potassium-depletion caused by amphotericin B. Patients receiving any of these combinations should be cautiously observed for their plasma electrolyte concentration, paying special attention to potassium levels. Coadministration of corticosteroids and coumarin-type anticoagulants may increase or diminish the anticoagulant effect, possibly requiring dose adjustment. Concomitant use of AINS agents and glucocorticoids or alcohol may increase the incidence of severity of gastrointestinal ulcers. The clearance of salycilates may be increased with concurrent use of corticosteroids. Acetylsalicylic acid should be used cautiously in conjunction with corticosteroids in hypoprothrombinemia. When administering corticosteroids to diabetic patients, dose adjustment of antidiabetic agents may be required. Concomitant treatment with glucocorticoids may inhibit response to somatotrophin. Interactions with laboratory tests: Discontinue administration of Frenaler Cort approximately 48 hrs before performing any type of skin tests, as antihistamines may prevent or diminish development of reactions which otherwise would be positive to dermal reactivity indicators. Corticosteroids may alter the outcome of the nitroblue tetrazolium test for bacterial infection thus leading to false-negative results. Pregnancy: up to date inoquity of combination of Destoratadine and Betamethasone for it’s used during pregnancy has not been established. Therefore, Frenaler Cort should only be administered if potential benefits to the mother justify the potential hazards to the fetus. Lactation: desloratadine and corticosteroids pass into breast milk. It is recommended not to administer Frenaler Cort to nursing mothers. At the recommended doses Frenaler Cort does not have clinically significant sedative effects. More commonly described adverse reactions in patients receiving Desloratadine include: pharyngitis, headache, dry mouth, somnolence, fatigue, flu-like symptoms, myalgia, nausea, dizziness, dry throat and dyspepsia. More rarely following adverse events were reported: tachycardia, hypersensitivity reactions (such as rash, pruritus, urticaria, edema, dyspnea and anaphylaxis), and elevated liver enzymes and bilirubin. Adverse reactions reported for Betamethasone were similar to those reported for other corticosteroids and were related to dosage and treatment duration. Normally those adverse reactions may be reverted or minimized upon dose reduction, which is generally preferred to treatment discontinuation. Fluid and electrolyte disturbances: sodium retention, potassium loss, hypokalemic alkalosis, fluid retention. Cardiovascular: congestive heart failure in sensitive patients, hypertension. Musculoskeletal: muscle weakness, steroid myopathy, loss of muscle mass, increase in severity of myasthenia gravis, osteoporosis, vertebral compression fractures, aseptic necrosis of femoral and humeral head, pathologic fracture of long bones, tendon rupture. Gastrointestinal: peptic ulcer, digestive hemorrhage, pancreatitis, abdominal distention, peptic esophagitis. Dermatologic: impaired wound healing, cutaneous atrophy, thin fragile skin, petechiae and ecchymoses, facial erythema, increased sweating, suppression of reactions to skin test, allergic dermatitis, urticaria, angioneurotic edema. Neurological: convulsions, increased intracranial pressure with papilledema (pseudotumor cerebri) usually following discontinuation treatment, vertigo, headache. Endocrine: menstrual irregularities, development of cushingoid state, suppression of intrauterine fetal growth or of growth in pediatric patients, secondary adrenocortical and pituitary unresponsiveness (particularly in times of stress, such as trauma, surgery or illness), decreased carbohydrate tolerance, manifestations of latent diabetes mellitus, increased requirements for insulin or order hypoglycemic agents in diabetes. Psychiatric: euphoria, mood swing, depression, psychic disorders, personality changes, hyperirritability, insomnia. Others: anaphylactoid or hypersensitivity reactions and hypotensive reactions or reactions similar to shock conditions. Frenaler Cort Tablets: Adults and children 12 years of age and older: 1 tablet once daily. Adults and children 12 years of age and older: 5 ml once daily. Children 6 to 11 years of age: 2.5 ml once daily. Children 2 to 5 years of age: 1.25 ml once daily (1/4 teaspoon). Dosage may be adjusted according to each patient’s needs. Treatment must be continued until a proper therapeutic response is observed. In adult patients with liver or renal impairment it is recommended to initiate treatment with half the recommended initial dose until the degree of therapeutic response is established. Once an adequate therapeutic response was achieved (suppression of allergic symptoms) treatment should be discontinued gradually, considering- if necessary- administration of an antihistamine agent as single drug. Treatment should also be gradually discontinued if during a chronic condition spontaneous remission occurs. If treatment has to be discontinued after prolonged administration, dosage should be decreased gradually. Patients subject to unusual stress situations not related to the treated condition may require an increase in Frenaler Cort. Desloratadine: due to poor existing experience, information regarding overdosage is limited to somnolence and increase in mean heart rate of 9 bpm. The QTc interval calculated by both the Bazett and Fridericia methods showed no significant changes as with respect to placebo. No clinically relevant adverse events were reported. Betamethasone: acute overdosage of corticosteroids, including Betamethasone, is not expected to lead to potentially fatal situations. It is also highly improbable that a few days of excessive corticosteroid administration should produce harmful effects in the absence of predisposing factors (diabetes mellitus, glaucoma or active peptic ulcer) and with no concomitant administration of certain substances such as digitalis, coumarin-type anticoagulants or potassium-depending diuretics. Treatment: once the patient was properly evaluated consider standard measures to remove any unabsorbed drug (vomiting, adsorption with activated charcoal, gastric lavage or administration of saline laxatives). Desloratadine and 3-hydroxydesloratadine are not eliminated by hemodialysis. Medical control is recommended specially emphasizing possible effects of corticosteroids on metabolism, internal medium and digestive system. Symptomatic and supportive treatment is recommended. Keep in dry place at temperature below 30 °C.